and focus on distinctive developments in the under-researched Asian region. Emphasizing five key issues work organization, skill formation, remuneration systems, staffing arrangements, and enterprise governance, the analysis is attentive to both issues of change and the role of agents in bringing about that change. The authors highlight the possibility that within any economy there may be a range of different and competing sets of institutional logics. 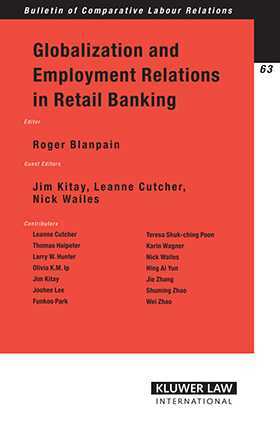 These informative and insightful articles represent the first empirical findings from the Globalization and Employment Relations in Auto-assemblies and Banking (GERAB) project. The book demonstrates that the research design of this project is a giant step toward sophisticated theoretical models that are capable of capturing and explaining the complex, contingent, and multi-causal relationship between employers and employees in the context of a changing world economy.